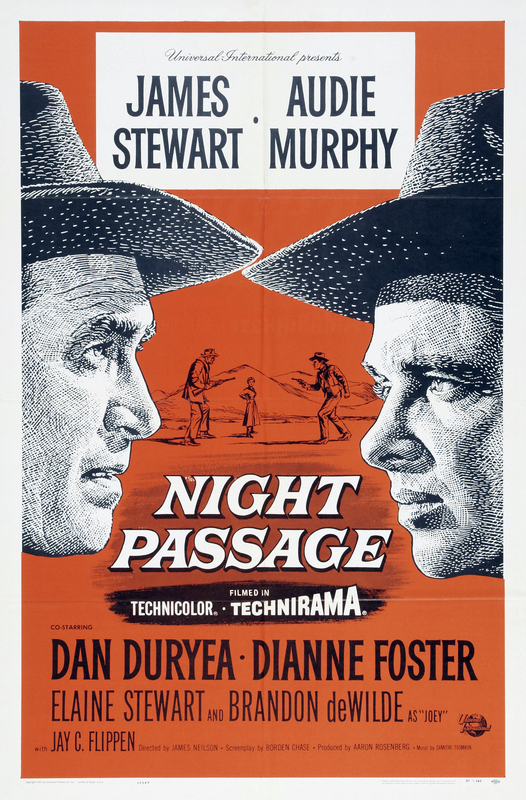 Jimmy Stewart: Night Passage (1957) – Did You See That One? Night Passage was the second of Stewart’s films to be released in 1957. Following The Spirit of St. Louis this film rounded his year and brought him back to work in a Western. His last work in the genre had been 1955’s The Man From Laramie. This movie would pair Stewart with director James Neilson (Moon Pilot) for the only time in his career. The story for this film came from Norman A. Fox (Gunsmoke) with the screenplay completed by Borden Chase (Winchester ’73). The rest of the cast included Audie Murphy (The Red Badge of Courage), Elaine Stewart (Brigadoon), Brandon De Wilde (Shane), and Hugh Beaumont (Railroaded!). This film also paired Stewart with Dan Duryea (Thunder Bay). The pair shared the screen on four films over the course of their careers. Grant McLaine (Stewart) has struggled to survive since being fired from his work on the new railroad. Now he’s been asked back by the same people who fired him to help protect a $10,000 payroll shipment from a band of marauders. When the railroad boss’s wife (Stewart) gets caught in the middle, McLaine is forced to take action. Now he’s working against a group of outlaws that he’s far too familiar with. This film might feel a bit like the Jimmy Stewart/Anthony Mann collaborations, and for good reason. Prior to the start of production Mann was slated to direct this film. Creative differences and casting decisions soon drove him from the project, making room for Neilson. Like the Mann westerns, this is anything but a formulaic movie. The emotional content is complicated and helps to deepen the relationship twists throughout the film. The dialogue is dated, but still brings out the right tones in the story. For Stewart, this was another opportunity to show off his many skills. Not only did the role ask for a deeper emotional performance, but also his musical skills. He’s also able to shine alongside a number of talented actors. Audie Murphy is a great choice for one of several antagonists in this film. His natural charm and charisma play nicely with his complicated role. Dan Duryea does a good job in this one as well. His solid performance adds a nice layer to the story. Elaine Stewart and Hugh Beaumont also do good work with their roles. Overall, the cast does a nice job with a well-written story. One other nice addition to this film is the casting of Brandon De Wilde. (De Wilde might best be known as the young Joey from Shane.) He has great chemistry with Stewart, and it adds something special to the film. This movie was the first feature film to use the new Technirama process from Technicolor. Cinematographer William H. Daniels (The Naked City) took full advantage of the process, which helped to bring out the richness of the colors. This process helped to make the fall colors and mountain sky stand out wonderfully. The railroad scenes were filmed on location in Colorado, and it helps to bring this one to life beautifully. The cinematography does a nice job in bringing the world of the film to life. The film also features two songs penned by Dimitri Tiomkin (High Noon) and Ned Washington (Strategic Air Command). “Follow the River” and “You Can’t Get Far Without a Railroad” were written for the film and performed by Jimmy Stewart. He also played the accordion for the film, an instrument he had played since childhood. Those songs are just a small part of a nicely written score that adds a great layer to the film. While this wouldn’t find the critical acclaim of the Mann westerns, this was a box office success. This still holds up after more than fifty years as a great example of Stewart’s skills as well as the skills of everyone else who contributed. Jimmy Stewart would follow this up with another classic when he completed Alfred Hitchcock’s Vertigo in 1958.